Eyelids closed, soft like feathers as my weary travel head snuggled upon a fuzzy surface. Buffet ballads emitted from speakers, returning thoughts to concerts with my aunt at Jones Beach. Senses inhale Banana Boat spray, as warmth from the Long Island sun falls upon my neck and shoulders. Summer limes plunk into chilled Landshark brews. We savor coconut shrimp, and their crunchy texture. Karaoke and cover bands pre-game, scattered throughout the massive tailgating party. Summer sun evaporates any remaining stress from my system. We giggle, witnessing parrothead costumes and vehicles disguised as sharks and tiki bars. Men riding motorized coolers take laps around, sporting coconut bras. The echo from the PA can be heard in the distance. First the kick, then toms, followed by cymbals and backline. Swans circle curiously in the water surrounding the venue, as jets take off into the evening sky. Surrounded in this peaceful state a noisy vacuum startles me, what is that? Waking abruptly, I comprehend I was dreaming far from Jones Beach. I rose, groggy head lifted off my $3.00 fuzzy pajama pant purchase. Reality sunk in as I checked emails and my flight status. Perhaps, you assume I was slumbering at the Waldorf. No friends, I was enjoying free overnight accommodations in a domestic terminal in JFK. Another standby adventure, another stranded overnight. Can you believe I scored a comfortable, unoccupied, green bean bag bed in a warm location, along with good tunes?! I did! It may have trumped a Waldorf experience. I had free wifi, an indefinite check out time, plenty of outlets, a spacious restroom, and no parking fees. House keeping vacuumed around my shoes that night, ensuring a clean stay. Departure monitors kept me updated and without need for a yellow cab or calculating traffic delays and security lines, I had more time to sleep! The previous evening in NYC, surely someone would get stuck in traffic, allowing me to occupy their seat home, or so I assumed. However, I missed the last outbound by one available seat, one! I had flown into the city to explore with a friend for just the day. I had no non-rev anxiety about my return, immersed in the present, dusting off country mud and taking in city lights. 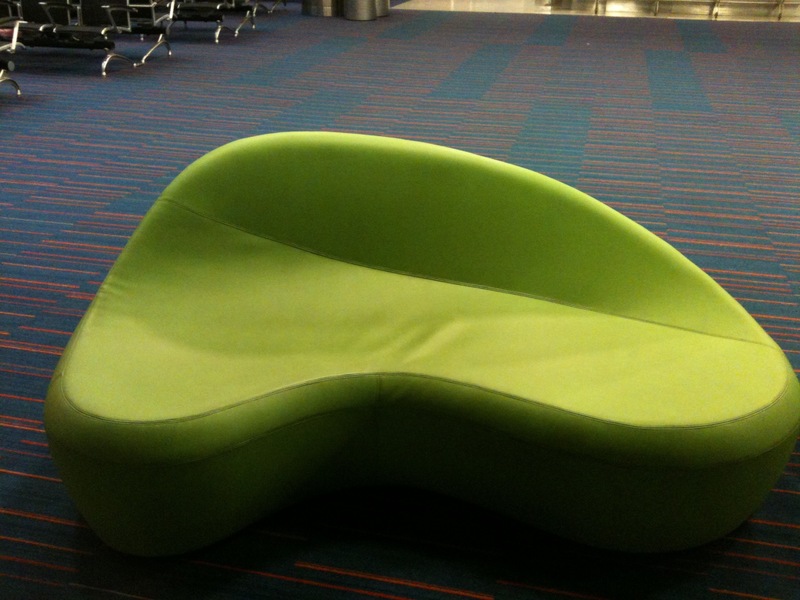 I have spent numerous nights in upright L-shaped pleather seats, in terminals around the world. Situations such as these may not sound ideal to the average traveler, but to me they build character, provide fun stories and a survival shell. Most memorable was the night I slept outside in the woods alone near the runway in Luxembourg, unaware my exact location until the sun rose. An abandoned tire was the only thing propping my traveling torso from rolling down the hill onto foreign Tarmac. When stranded, perhaps try to make the most of your inconvenient, less than Waldorf comforts. Sometimes, those are the precious memories that last a lifetime.